Eustigmatophytes are a small group (12 genera; ~41 species) of eukaryotic algae that includes marine, freshwater and soil-living species. All eustigmatophytes are unicellular, with coccoid cells and polysaccharide cell walls. Eustigmatophytes contain one or more yellow-green chloroplasts, which contain chlorophyll a and the accessory pigments violaxanthin and β-carotene. Eustigmatophyte zoids (gametes) possess a single or pair of flagella, originating from the apex of the cell. Unlike other heterokontophytes, eustigmatophyte zoids do not have typical photoreceptive organelles (or eyespots); instead an orange-red eyespot outside a chloroplast is located at the anterior end of the zoid. Ecologically, eustigmatophytes occur as photosynthetic autotrophs across a range of systems. 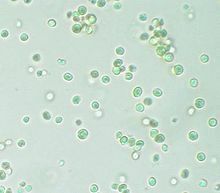 Most eustigmatophyte genera live in freshwater or in soil, although Nannochloropsis contains marine species of picophytoplankton (2 → 4 μm). The class was erected to include some algae previously classified in the Xanthophyceae. ^ Guiry, M.D. & Guiry, G.M. (2016). "Eustigmatales". AlgaeBase. National University of Ireland, Galway. ^ Hoek, C. van den et al., p. 131. ^ Hegewald E., Padisák J., Friedl T. 2007. Pseudotetraëdriella kamillae: taxonomy and ecology of a new member of the algal class Eustigmatophyceae (Stramenopiles). Hydrobiologia 586 (1): 107—116. This chromalveolate article is a stub. You can help Wikipedia by expanding it. This page was last modified on 7 November 2016, at 04:38.